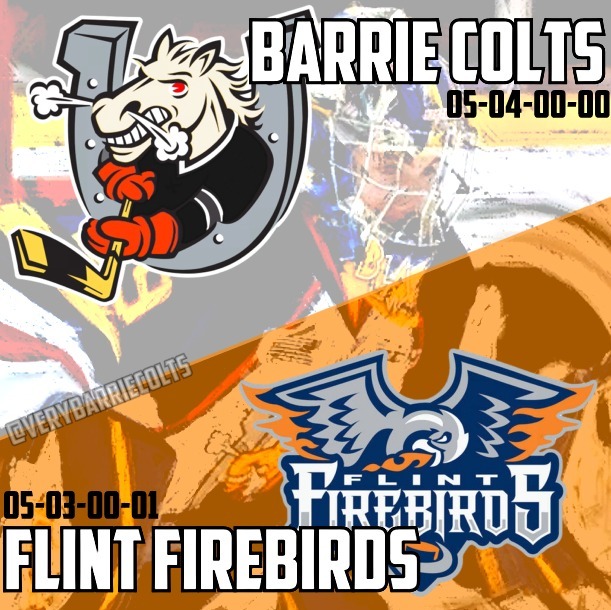 Game Preview: Barrie Colts host Flint Firebirds for the first time. #OHL - Very Barrie Colts | A website covering the Barrie Colts of the OHL. Tonight the Barrie Colts host the Flint Firebirds for the first time since Flint relocating from Plymouth last season. This is the first of 2 meetings between these teams this regular season. Last season Plymouth and Barrie won a game a piece in the 2 meetings. Flint is coming off of a 7-4 win this past Friday over the Ottawa 67's. Red Wings prospect defenseman Vili Saarijärvi would score 2 goals (including his first ever OHL goal) in the meeting and added an assist to his 14 point total on the season over 9 games. Will Bitten (great Halloween name btw) would finish the game also with 4 assists. Flint was successful in this game because they managed to go 2 for 2 on the power play and went 1 for 7 short handed. It is amazing how a strong power play can help you win games. Flint came out hard scoring 5 of their goals in the first period. Colts will want to look for this Firebirds team to come out strong. Barrie lost 3-1 to the Kitchener Rangers last Saturday on home ice so I would expect Barrie to come out strong tonight. Might have been the one game of the season where Blackwood wasn't his strongest allowing 3 goals on 24 shots. Colts managed to play a disciplined game for the most part but Andrew Mangiapane was the only Colt able to get on the score sheet. We can assume Blackwood will have a strong game tonight since starts like the one against Kitchener are not normal for him. I am sure he will be fine. I find this comforting for some reason..
A win for the Colts could get them back into first place in the Central Division over the Mississauga Steelheads who lead the Colts by 2 points in the standings. It should be noted as well that Mississauga has 2 games in hand and that North Bay is also tied for points with Barrie. Flint hopes to get a win to get a little closer to the top of the West Division. Keys to Success: Shut the Firebirds down early. They will come out hard and the Colts need to be ready. Some early action could help Blackwood get back in form and hopefully some of our scorers can start putting up some more goals. Barrie currently is tied for second least goals in the OHL which is pretty tough after last years team having 3 different 100+ point getters. If the OHL ever decides what to do with Lemieux, him eventually coming back will hopefully add more skill up front. Sadly, we may wait a while before the OHL makes mention of the suspension. Maybe even FOREVER!! EDIT: OHL Suspends Brendan Lemieux for 10 games. Players to Watch: I expect Blackwood to put on a show tonight after his last game. Not that he was terrible but he no doubt will want to give his team a better chance. I also would keep an eye on Roy Radke who has been good and you know he is going to start putting up more points soon. He has shown great energy and only putting up points in 3 of his last 9 games doesn't reflect his effort in games and on the penalty kill. He has been a monster. Puck drop is scheduled for 7:30 at BMC.